Today, consumers are very much aware that their every move creates a data trail. Only a technology recluse who always pays cash and doesn’t own a smartphone or a car is ‘data clean’. Some people will tell you they’re very careful but the fact remains it’s very difficult to lead a ‘normal’ life in our modern society without leaving some sort of data trail. I recently conducted a global study in collaboration with data collection partner SSI and translation agency No Problem! to take a closer look at current consumer views on the treatment of personal data. The conclusion was that consumers still trust companies with their data but consumer awareness is increasing. Their message is clear and unmistakable: you can use our data as long as it’s to our own benefit. 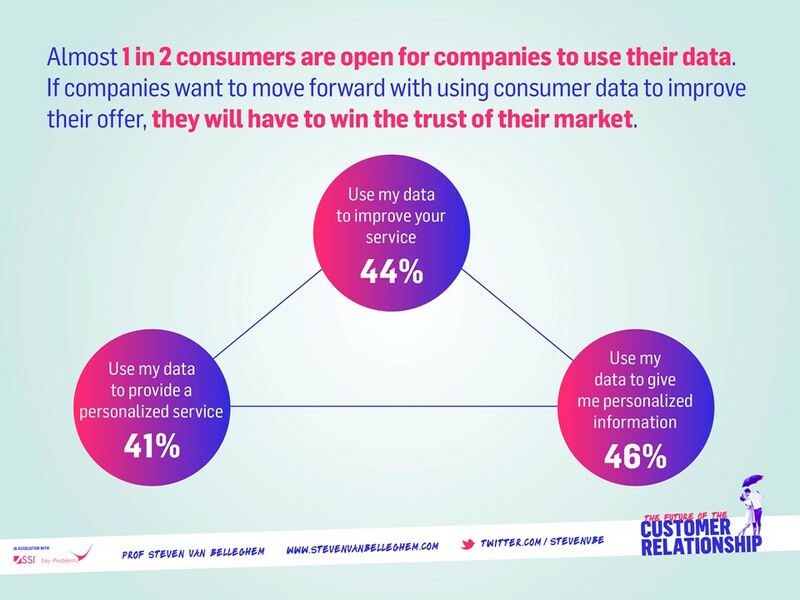 Consumers still trust companies with their data but only to a certain extent. 53% of respondents claim to trust companies to use their data for the right purpose. Conversely, not even one in two (47%) respondents trust the government with their personal details. Trust is the key issue in the entire data debate. The mere perception of the improper use of data is enough to make consumers rise up in protest. Companies can earn the consumer’s trust by proving year after year they will only use their data for the right reasons. A large portion of the public are still clueless as to what companies can use their data for. The answers to our questionnaire revealed very little opposition to the possible use of consumer data for specific purposes but, at the moment, only a limited number of consumers are clearly in favor of such practices. Most consumers are neither in favor nor against and have adopted a ‘wait & see’ attitude. If consumers had their way, companies would primarily use their data to send them personalized information, something that 46% of respondents would welcome. It’s striking to note that the Dutch, who are traditionally front runners in the field of digitization, are the most skeptical of the corporate use of personal data. 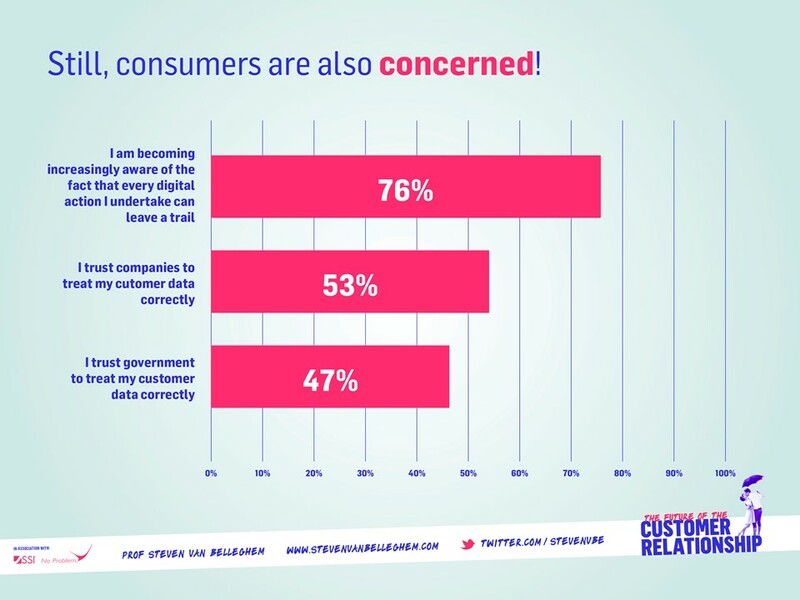 A mere 30% of Dutch consumers are OK with companies using their data. Countries such as Belgium, Spain, Italy and also Singapore are much more open to such strategies: over 50% of their consumers expect better service through the use of consumer data. There are many subtle indications to suggest that data awareness has never been higher and our study confirms this. 76% are very aware that everything they do in this world leaves a data trail. 65% are becoming increasingly careful in sharing their personal details. 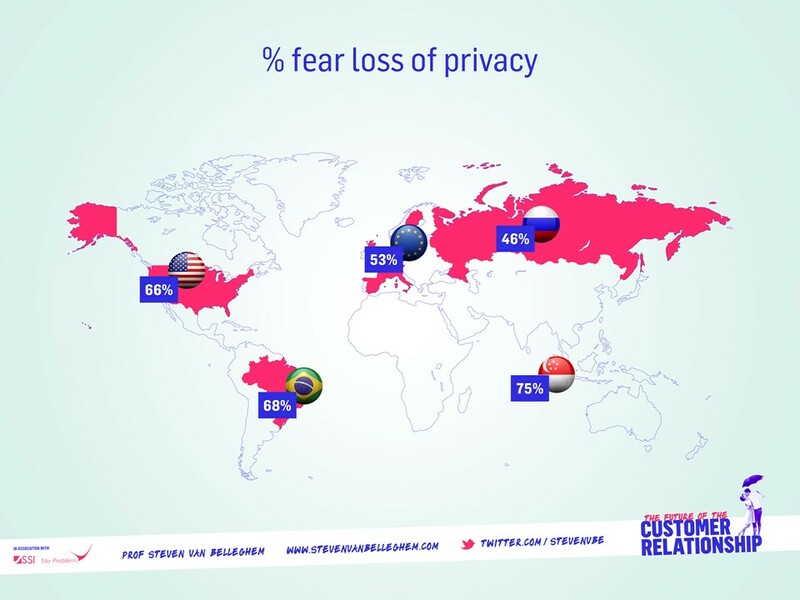 Finally, more than half (54%) are somewhat afraid of losing all privacy. Data and the way in which companies and ‘the powers that be’ use them will undoubtedly remain at the heart of the marketing debate over the next few years. Some are bound to cross the line at some point and those that do will get burned; others will do amazing things with our data and earn our trust. However, the results of this study are clear as day: both the government and the corporate world are walking a very thin line. 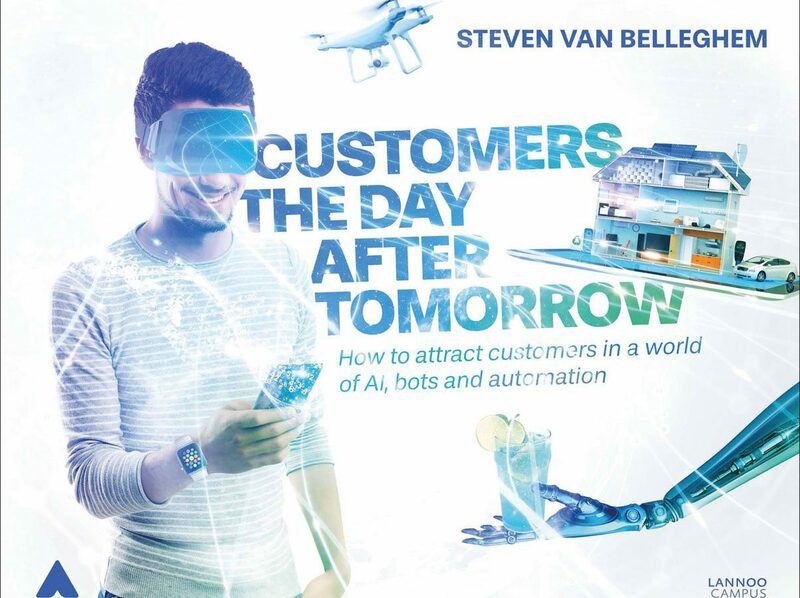 This study is part of a larger study on the Future of Customer Relations. Check this slidedeck to see all results.